Power - 5v @ 100mA max. I2C operation is activated when the mode pin is left open circuit. The RLY08 is located on the I2C bus at a factory default address of 0X70. The SCL and SDA lines should have pull-up resistors on them somewhere on the bus. You only require 1 pair of resistors for the whole I2C bus, not specifically for the RLY08. They are normally on the master controller and you may already have them. If not, anything between 1k8 and 10k should work. I recommend 1k8 for best noise immunity. The RLY08 has only two registers, register 0 and acts as a dual purpose register. When written to it is the command register where all of the instructions from the commands section should be sent. When read it returns the software version. To change the I2C address of the RLY08 you must have only one module on the bus. Write the 3 sequence commands in the correct order followed by the address. Example; to change the address of a RLY08 currently at 0x70 (the default shipped address) to 0x7A, write the following to address 0x70; (0xA0, 0xAA, 0xA5, 0x7A ). These commands must be sent in the correct sequence to change the I2C address, additionally, No other command may be issued in the middle of the sequence. The sequence must be sent to the command register at location 0, which means 4 separate write transactions on the I2C bus. When done, you should label the module with its address, however if you do forget, just power it up without sending any commands. The RLY08 will flash its address out on the LED. One long flash followed by a number of shorter flashes indicating its address. The flashing is terminated immediately on sending a command to the RLY08 and then becomes a power LED. Take care not to set more than one module to the same address, there will be a bus collision and very unpredictable results. Serial Mode is selected by connecting the Mode pin to ground. The Tx pin is out of the RLY08 and should be connected to Rx on your controller. The Rx pin is into the RLY08 and should be connected to Tx on your controller. These signals are 5v levels, not RS232. Do NOT connect RS232 directly to the module - you will destroy it. 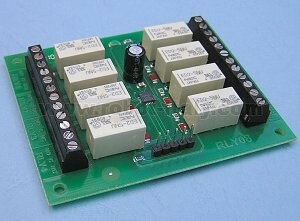 Use a MAX232 or equivalent to convert the RS232 levels to 5v. The Serial mode operates over a link with a baud rate of 9600 bps (no parity, 1 stop bit) and 5v signals, The RLY08 can be found at a factory default address of 1, although this is easily changed to another of eight locations - see Changing the RLY08 Address . To send a command to the RLY08, you need to send two bytes. The first is the RLY08's address 1 (default) to 8, and then the actual command itself - see below. The RLY08 will then carry out the command and if applicable send its response. The only exception to this being the "Set relay states" command, it requires an additional required states byte to be sent immediately after the command byte. This will then set all relays to the status of the equivalent bit within the byte, with a high bit powering the relay on and a low bit turning it off. 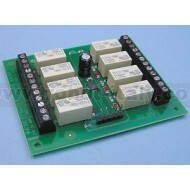 To change the address of the RLY08 you must have only one module connected. Write the 3 sequence commands in the correct order followed by the address. For example; to change the address of a RLY08 currently at 1 (the default shipped address) to 5, write the following to address 1; (0xA0, 0xAA, 0xA5, 0x05 ). These commands must be sent in the correct sequence to change the address, additionally, No other command may be issued in the middle of the sequence. The sequence must be sent as four separate commands to the current address of the module. i.e. 0x01, 0xA0 then 0x01, 0xAA, then 0x01, 0xA5 and finally 0x01, 0x05. When done, you should label the module with its new address, however if you do forget, just power it up without sending any commands. The RLY08 will flash its address out on the LED. One long flash followed by a number of shorter flashes indicating its address. The flashing is terminated immediately on sending a command the RLY08.